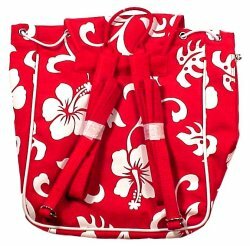 Our newest line of Hawaiian Hibiscus Print Bags truly capture the spirit of our islands. This popular print makes these bags a must have for your endless summer! 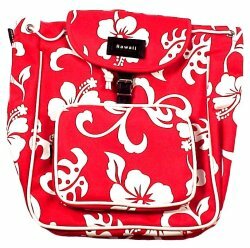 This backpack is great for storing all your stuff for school, work or the beach. Made from high quality nylon this back pack features a front zipper pocket, front buckle closure, top satchel ties, side zipper for easy access and adjustable back straps. Available in Hibiscus Red and Hibiscus Navy. Designed in Hawaii.